Where present value is $1, future value is $0, and Type=1 signifies that payments are due at the beginning of the period. The result is 6.1034%. How is the formula adjusted to account for the payments made in the beginning of the period, since the actual value for the purposes of this calculation is not known? Or am I misunderstanding something? 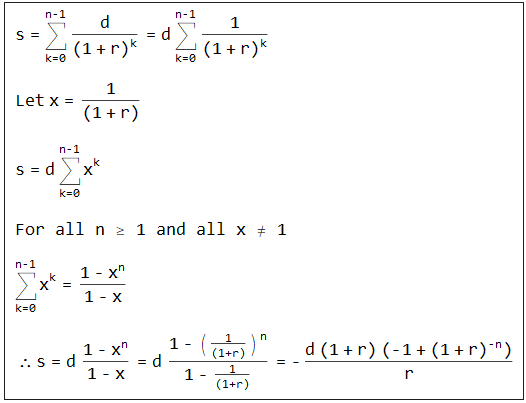 Your mathematical formula can be adjusted by dividing by (1 + Interest Rate/12), i.e. type = 1 is for payments at the beginning of the period, so you are calculating the payments for an annuity due. Your mathematical formula is for an ordinary annuity; payments made at the end of the period. The principal equals the sum of the payments discounted to present value. That is the factor we have to multiply by to get from "beginning of period" to "end of period", so we have to divide by that to go the other way. Not the answer you're looking for? Browse other questions tagged mortgage calculation or ask your own question. Calculate time to reach investment goals given starting balance?